With respect to entertainment and socializing, graduate students are facing a bit of a catch-22: their university affiliation affords them tons of opportunities for free and subsidized entertainment, yet they often think they are too busy to take advantage. However, all work and no play makes for a burned-out PhD student. When you do manage to escape from the lab or library, there are numerous ways to have fun without straining your wallet. 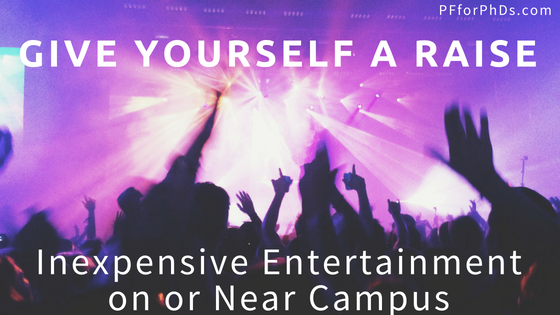 When you plan a night out with your peers or want to see a show, check on your free or subsidized options through your university before paying full price. From happy hours to dances to sponsored outings, universities put on tons of free events year-round for students, anywhere from once per year to as frequently as once per week. Your graduate student government is probably the best place to start looking for sponsored activities and opportunities to socialize with your peers. The graduate student government at my alma mater hosted happy hours about once per month, paid for students to go bowling and to minor league baseball games, and hosted trivia nights and ice cream socials. Other student organization may sponsor similar nights out to bars or local attractions such as museums and planetariums. I have to admit that I was not a fan of any college sports until I got to graduate school, but I found my alma mater’s basketball culture irresistible. Grad students who enjoy watching football, basketball, or many other sports will be able to attend events for free or at a highly subsidized rate. Or if watching sports isn’t your thing, maybe tailgating is! Intramural sports are a great combination of entertainment, exercise, and socializing. There are most likely grad student teams competing against each other and undergraduate teams in softball, volleyball, flag football, basketball, etc. Because you are using university facilities, the fees to participate in such teams are typically nominal. Similar to spectator sports, you can likely attend student theater productions on campus for a very low price. There may be a museum or botanical garden on campus that is free for students. Free or subsidized concerts and movies are also common, though you might not see the newest releases. My alma mater screened both of the PhD Comics movies for free, which were wonderful events designed specifically for graduate students, and also hosted two large free outdoor concerts each spring. The start of the school year is a great time to find free entertainment as clubs are recruiting new members. You can keep an eye on club calendars for events that you might enjoy, such as stargazing, games, gardening, hiking, or volunteering. Most cities cultivate a calendar of events for residents and visitors to reference. Over the summer months, these calendars burst with lovely outdoor activities that are often free or inexpensive, such as festivals, concerts, and movies. This can be a great way to stay entertained when the university’s calendar tends to be more dormant. Local bars and coffee shops in college towns also frequently host live performances that draw in a student crowd. Your graduate student ID almost always works just as well as an undergraduate’s for scoring reduced-price tickets in the community. Many venues such as theaters, sports stadiums, and museums offer discounted rates of entry to students on set days of the week or month or a few times per year. My husband and I held season tickets to the Broadway shows at our local theater for several years on Sundays or Tuesdays, which were the student discount nights. You don’t need a subscription to Netflix, Hulu, or Amazon Prime to enjoy watching movies in your home. Your university and local public library should have an excellent selection of titles that you can check out for free. One of the best aspects of grad school is the built-in social network it gives you within your school or program. Parties can be easily planned alone or with a few other hosts in homes, at pools, in bars or restaurants, or in parks, and designating them as potluck, Dutch, or BYOB means that no one is shouldering the cost alone. One of my favorite aspects of grad student life was getting together with other basketball fans to watch our team play away games on TV. We even had an informal arrangement with another couple that we would host watch parties for all the games that were broadcast over the air while they would host for all the games shown on cable (removing the primary argument for us to keep paying for cable). You can arrange watch parties at home and sometimes at bars for whatever kind of entertainment you enjoy – sports, popular TV shows, movies – as long as you know a few other people with that common interest. How do you keep yourself entertained and socialize on campus and in your city without busting your budget? How have you used your student status to get discounts on entertainment?